For this week's A Snap, A Set and A Song the theme is Life. 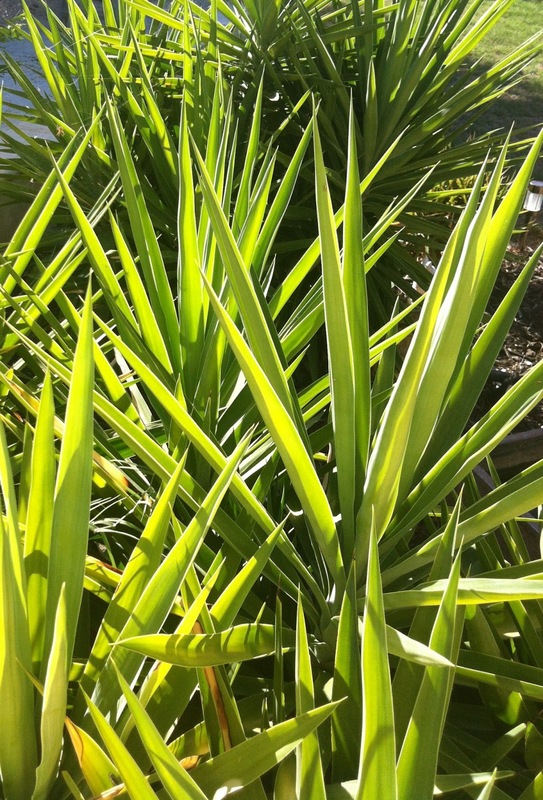 I looked around my garden for some inspiration, and decided that the leaves on these yucca plants were shining examples of life. My song choice is a wonderful, uplifting tune from 1985. This is not the official video for the song, but it has some great stills of Howard Jones. So love the eighties! Pop on over to Thea's blog to see other people's interpretations of the Life theme. Great SS&S! It's still 3 weeks from spring here and it will be good to start seeing signs of life soon. Love the green in the snap and set. Never heard that song - but I think I was too busy raising 2 little ones in the 80's to listen to much radio. I love the colours in your snap. You set is fabulous!! I love everything, the colours, the dress, the bag, the shoes, the perfume, the earrings...perfect! And great quote. Thank you so much for bringing a bit of Howie back into my life. I loved him so much in the 80s. I still know all the words.